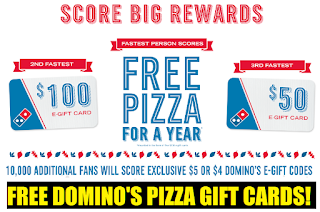 Free Domino's Pizza Gift Card Giveaway - 10,003 Winners. Win Gift Cards Worth $4, $5, $10, $50, $100 or $500. Text Offer This is a giveaway to the first 17,503 that sign up when it goes live. The way it works is you sign up with your number and when it goes live they will text you a link to claim yours. The first 17,503 to sign up once they send the link will get a free gift card. They do not tell you when it goes live, however, if you share you link with your friends you may receive a heads up text a couple of minute before it goes live. Note: Even if you get a heads up text, everybody will get the actual sign up link at the same time. So in effect sharing with your friends only gets you a notification of when it is going live, but no advantage in the actual contest.
. They will text you your link to enter when it goes live, everybody will get the entry link at the same time so everybody has the same chance to win. The first 10,003 to sign up once they send the link will get a free Gift card, see below for the amounts.